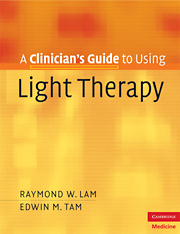 An excellent resource for clinicians with up-to-date information on how to incorporate light therapy into clinical practice. Light therapy is an effective, evidence-based, non-pharmacological treatment for seasonal affective disorder (SAD) and other depressive and circadian sleep conditions. This step-by-step guide helps busy mental health clinicians and other health professionals to better diagnose SAD and incorporate light therapy into their everyday clinical practice. The authors summarize the diagnostic process, describe a simplified method for light therapy and provide practical information on how to evaluate and obtain light devices. Invaluable clinician resources such as educational handouts, lists of frequently asked questions, instruction sheets, rating scales and suggestions for additional sources of information are also included. Case studies are used throughout to illustrate the processes and techniques in their clinical context. Preface; 1. Seasonal Affective Disorder: diagnostic issues; 2. Light treatment; 3. Light devices; 4. Other treatments: alone and combined with light; 5. Effectiveness and mechanism of action; 6. Light treatment for other conditions; 7. Clinician resources.